How do you know time's up? The scoreboard says so! Indoor/Outdoor Tabletop Scoreboard can be used to score basketball, volleyball or wrestling. Remote makes the scoreboard easy and convenient to use. Plus, when there's no game, you can use the scoreboard at practices — as a stopwatch, metronome, program timer or clock with alarm. You'll appreciate the versatility and portability of the Indoor/Outdoor Tabletop Scoreboard. 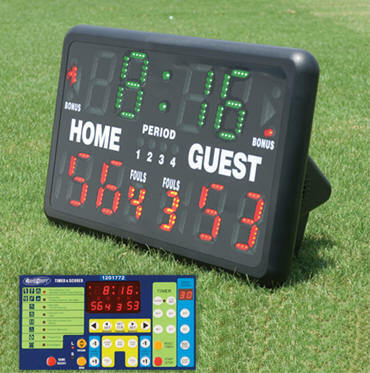 We offer the best portable outdoor scoreboards for sale at discount prices! Our tabletop model can be usedoutdoor or indoor and doubles as a sports clock.